Vienna, 1782. Mozart had not composed a string quartet for almost ten years, a remarkably long period within such a short lifespan. The two string quartets K387 and K458 belong to the group of six so-called �Haydn Quartets�. Mozart dedicated the work to his fatherly friend Joseph Haydn, who was in many cases also his great model. To dedicate such works to Haydn in his prime genre, testifies on the one hand to Mozart�s appreciation of his older colleague, and on the other to a high degree of self-confidence. Neither did he refrain from mentioning that these compositions were the �fruit of long and laborious task�. 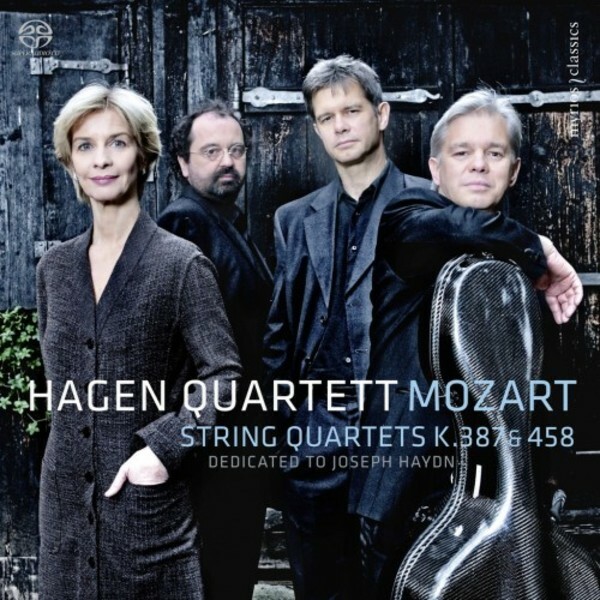 After an extended tour performing Mozart quartets, the Hagen Quartet went into the recording studio for this new rendition of the two works for myrios classics. This is also the Hagen�s first recording using the �Paganini Quartet� � the only complete set of Stradivarius instruments known to exist today. All four were once owned by Niccol� Paganini.